You can still use the editor on the left. Always keep a backup and verify your code before publishing! This website doesn't send your code to the server and doesn't save it. We use Google Analytics and AdSense cookies. Please report if you find an error or you have any suggestion. The current URL (link) is not containing your custom identifier license code. If you are a member please use your own custom URL you have received, otherwise please purchase a license. Get rid of your dirty markup with the free online HTML Cleaner. It's very easy to compose, edit, format and minify the web code with this online tool. Convert Word docs to tidy HTML and any other visual documents like Excel, PDF, Google Docs etc. It's extremely simple and efficient to work with the two attached visual and source editor which respond instantly to your actions. 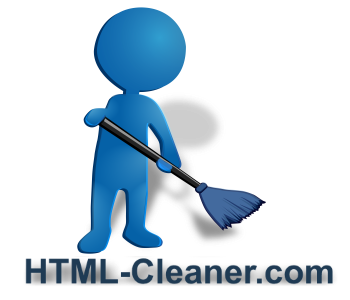 HTML Cleaner is equipped with many useful features to make HTML cleaning and editing as easy as possible. Just paste your code in the text area, set up the cleaning preferences and press the Clean HTML button. It can handle any document created with Microsoft Excel, PowerPoint, Google docs or any other composer. It helps you easily get rid of all inline styles and unnecessary codes which are added by Microsoft Word or other WYSIWYG editors. This HTML editor tool is useful when you're migrating the content from one website to the other and you want to clean up all alien classes and IDs the source site applies. Use the find and replace tool for your custom commands. The gibberish text generator lets you easily add dummy text to the editor. On the top of the page you can see the visual editor and the source code editor next to each other. Whichever you modify the changes will be reflected on the other in real time. The visual HTML editor allows beginners to easily compose their content just like when using any other word processor program, while on the right the source editor with highlighted code markup helps the advanced users to adjust the code. This makes this online program a nice tool to learn HTML coding. If you stack with HTML coding problem just ask essay writing service Edubirdie to provide you an assistance. Try college paper writing service at copycrafter.net and forget about pain of academic writing. Check out Myhomeworkdone.com for excellent programming help. Visit Ewritingservice.com in case you need writing assistance. To publish online PDFs, Microsoft Word, Excel, PowerPoint or any other documents composed with different word editor programs or just to copy the content copied from another website, paste the formatted content in the visual editor. The HTML source of the document will be immediately visible in the source editor as well. The control bar above the WYSIWYG editor controls this field while all other source cleaning settings are for editing the source code. Click the Clean HTML button after setting up the cleaning preferences. Copy the cleaned code and publish it on your website. There's no guarantee that the program corrects all errors in your code exactly the way you want so please try to enter a syntactically valid HTML. Convert the HTML tables to structured div elements activating the corresponding checkbox. In the past web designers used to build their websites using tables to organize page layout, but in the era of responsive web design tables are outdated and DIV's are taking their place. This online tool helps you turn your tables to structured div elements with a few simple clicks. You can make your source code more readable by organizing the tabs hierarchy in a tree view. This website is a fully functional tool to clean and compose HTML code but you have the possibility to purchase a HTML G membership and access even more professional features. Using the free version of the HTML Cleaner you consent to include links in the edited documents. This cleanup tool might add a promotional third party link to the end of the cleaned documents and you need to leave this code unchanged as long as you use the free version.